The ion engine will be used for changing orbit during the cruising of the Hayabusa2’s onward journey to the asteroid and return trip to Earth. The engine enables to make the round trip with only one tenth of the power consumption compared to that of chemical propellant. Carefully coordinating each part of the ion engine to improve both ion source propulsion generation efficiency and ignition stability. To make the neutralizer’s lifespan longer, the walls of the electric discharge chamber are protected from plasma and the magnetic field has been strengthened to decrease the voltage necessary for electron emission. *Due to design changes, we successfully increased the maximum propulsion power to 10 mN (mili-Newton) per ion engine from the conventional 8 mN. The SMP will collect samples from the surface of the asteroid. The seal performance has been improved for the Hayabusa2, and the newly developed metal seal method is applied, so that volatile gas such as rare gas can be brought back thanks to high airtightness. The number of compartments for the catcher that will store captured materials is increased by one to three compartments compared to two for the Hayabusa. For the Hayabusa2, the edge of the sampler horn was folded back inward as you can see in the left figure so that sand gravel can be hung on the cuff (gravel of 1 to 5 mm can be captured.) If the explorer makes an emergency stop during its ascending, gravel will keep going up to be stored in the catcher. This mechanism is a backup for sample retaining. The target marker is structured like a beanbag* so that it will not bounce on the surface when it is dropped from the explorer. 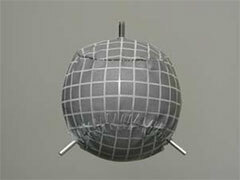 *A beanbag structure means that a hard container is filled with many small grain particles. The surface is made of material that reflects light well. Thin sheets etched with names are contained in the markers. At the end of the Hayabusa2 mission, the re-entry capsule with a container that carries samples from the asteroid onboard will re-enter the Earth’s atmosphere at 12 km/second. The re-entry capsule will be retrieved on Earth. Unlike the Hayabusa, the Riparian Ecosystem Management Model (REMM) to monitor the flight environment is equipped on the Hayabusa2 as an optional instrument so that acceleration, movement and inside temperatures during flight will be measured. Left: A conical shape structure filled with explosives. The “Liner” will be ejected forward at a high speed by explosive power. 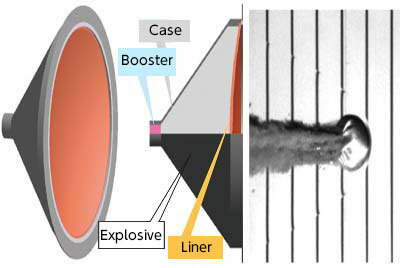 Right: The flying “Liner” at 2 km/s. * Click to see lager image. A 2 kg copper lump (an impactor called “Liner”) will be dropped to the surface of the asteroid at a velocity of 2 km per second to make an artificial crater by collision. We will study the inside structure of the asteroid by observing changes of the surface before and after the impactor (Liner)’s collision. In addition, we will survey the surface material characteristics by remotely monitoring underground matters that will be surfaced due to a collision. We will also conduct sampling from the crater to capture “fresh” materials hidden underground to find any differences with the surface. At the asteroid, we will conduct the “collision experiment in space” to acquire data necessary for planetary collision science. * The impactor (Liner) is made of pure copper to be able to easily identify from other materials on the asteroid. The Hayabusa2 will stay at its home position of 20 km above the asteroid 1999JU3, the target asteroid, to clarify the overall asteroid by remote sensing. 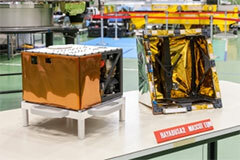 Two kinds of infrared observations will play an important role in this remote sensing. 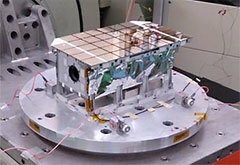 One is the near infrared spectrometer “NIRS3” to investigate mineral and water metamorphism or reciprocal chemical action of minerals and water by spectroscopic observations with near infrared rays. The other is the thermal infrared imager “TIR” to study the temperature and thermal inertia of the asteroid by capturing images of thermal radiation from the asteroid. In other words, it will find a particle of the soil and the porosity of the mass of rock that influence the temperature. The surface temperature of the asteroid experiences daily variations, meaning it goes up during the daytime when the sun shines but decreases during the night. Surface temperature differences in a day become bigger when it is covered by fine particles such as sand or porous rocks. On the other hand, the daily variation becomes small when the surface is solid rock. 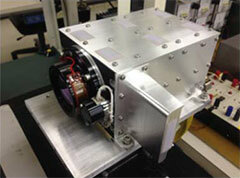 The TIR can shoot images of thermal radiation from the asteroid to find physical conditions of the surface. 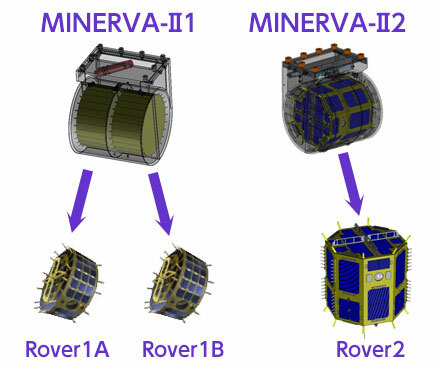 These small rovers will descend to the asteroid surface to study it. The three rovers are the successors of the MINERVA aboard the Hayabusa. 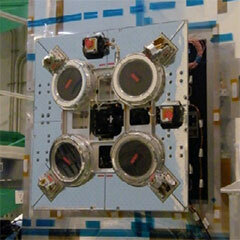 Each of them hops to move on the surface to conduct probes. 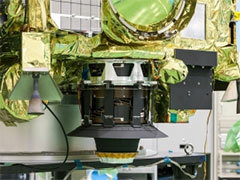 The small lander will land on the asteroid surface to study it with four observation devices. 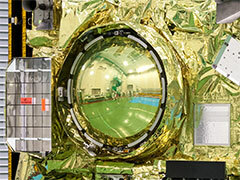 TheDLR (German aeronautics and space research center) and the CNES (French Space Agency) manufactured and provided the MASCOT. With the four observation devices (MicrOmega, MAG, CAM, and MARA) onboard, the MASCOT jumps only once to move its location.